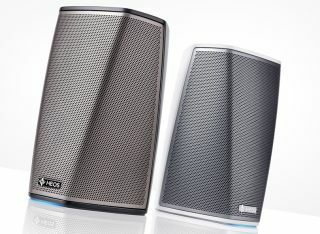 Denon adds portable HEOS 1 to multi-room speaker range | What Hi-Fi? The HEOS 1 is the smallest speaker in the Denon HEOS range and can be used on the move thanks to the option of a battery pack and a Bluetooth adapter. Denon says the sound delivered by the small speaker is “clear and expansive” and has been specifically designed with stereo playback in mind - two HEOS 1 speakers can be paired together to play in stereo. Users set up and control the speaker via the companion HEOS app for iOS, Android and Kindle Fire. The app works with a range of music streaming services including Spotify, Deezer, Napster and TuneIn. Alternatively, users can play music from PCs, Macs, NAS drives or USB storage devices. As with most multi-room systems, users can opt to have different songs playing on different speakers, or all speakers in a group playing the same song. The HEOS 1 benefits from a bi-amped two-way system with Denon’s own custom active EQ and crossover. Denon has also fitted a custom woofer and “high dispersion tweeter”, which is powered by a two-channel Class D amplifier. If you want a portable multi-room speaker, then there's the optional Go Pack. This "fits perfectly to the base of the HEOS 1" and adds a rechargeable battery with a claimed six hour life, a splashguard for full IPX4 protection and a Bluetooth USB adaptor, so users can still stream music when there’s no wi-fi around. The Denon HEOS 1 is available to pre-order now for £199. The Go Pack (above) will cost £79 but is available at 50 per cent off (£39.50) if you pre-order.